There’s a lot of Miata in this CX-3. 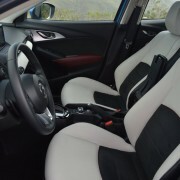 Anyone who’s spent quality time beyond the wheel of Mazda’s classic MX-5 (Miata) two seat sports car will immediately appreciate the detail spillover to the CX-3. 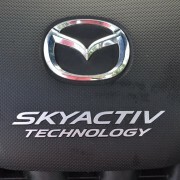 Mazda products are really all about feedback. You give a command and the vehicle responds to that directive instantaneously. 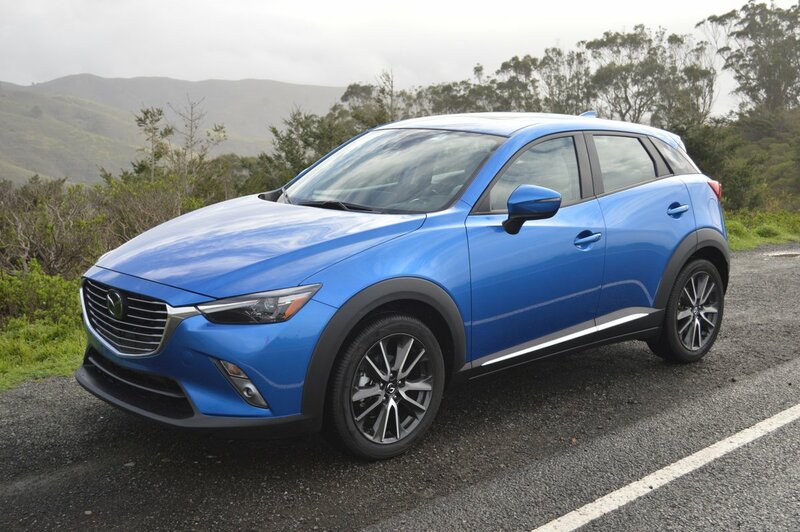 Like the Miata, the CX-3 – despite its SUV design and elevated ride height – reacts instantly when you turn the wheel, bang a downshift or hammer the throttle. 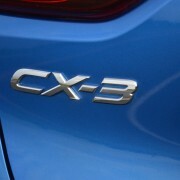 The CX-3 consistently displays such lightning quick reflexes that its operation becomes instinctual rather than forced. 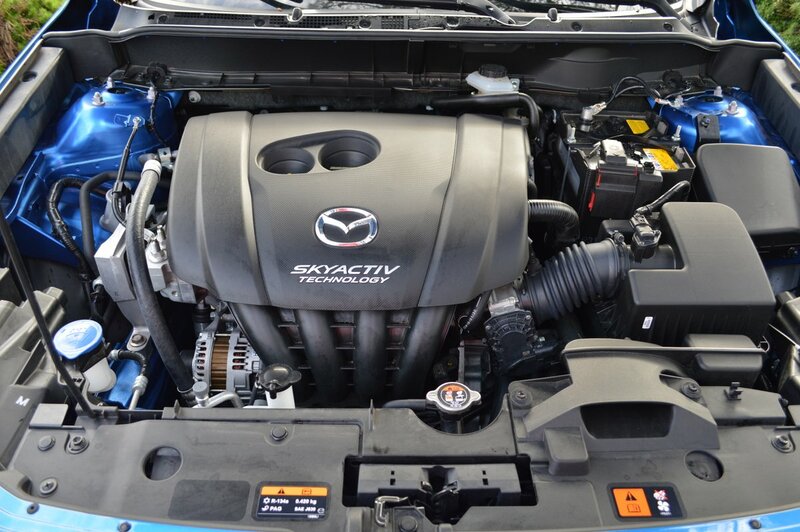 Like the Miata, the MX-3 is so underpowered (just 146hp) that it depends on its ultra precise handling and suspension composure to compensate for its lack of brute strength under the hood. 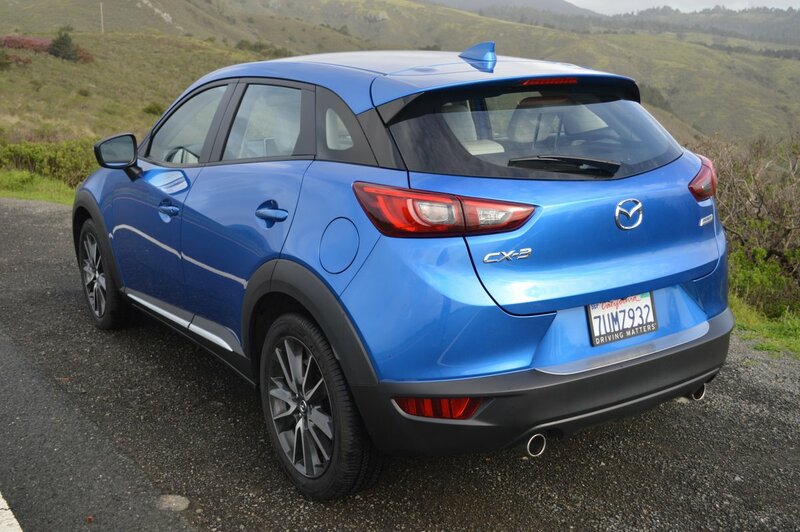 And like the Miata, the CX-3′s overall balance tips the fun-to-drive scale heavily in favor of this diminutive SUV. If you’re looking for a utilitarian family hauler, look elsewhere. 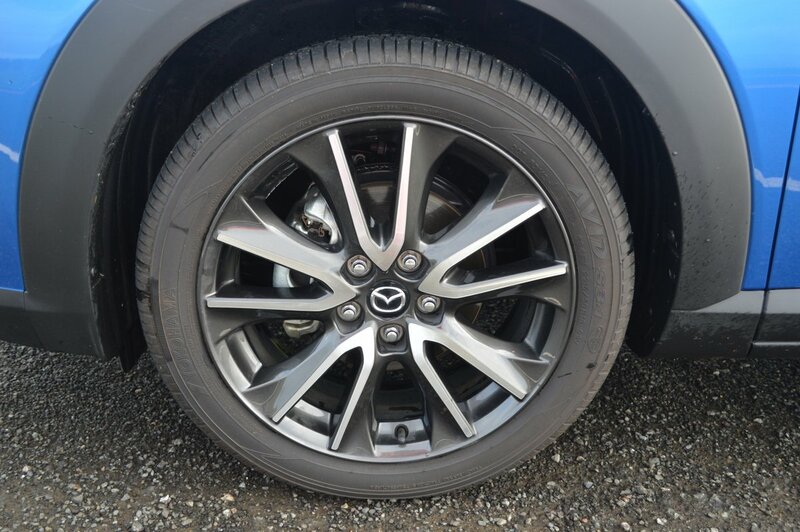 The CX-3′s 100 inch wheelbase is about 10 inches short of a full family six pack. And you most assuredly won’t be able to slide your bike into the rear hatch. 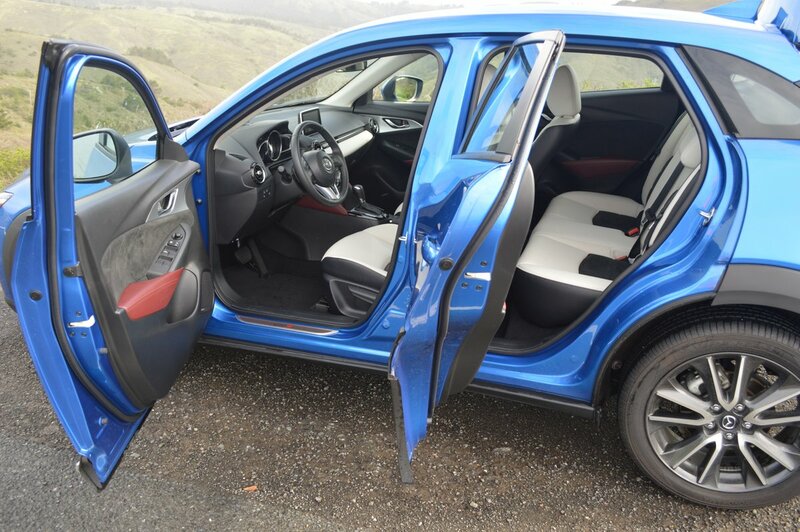 However, you will be able to accommodate a four pack of adults inside the CX-3. There’s enough front and rear legroom to allow four six footers sprawl room. 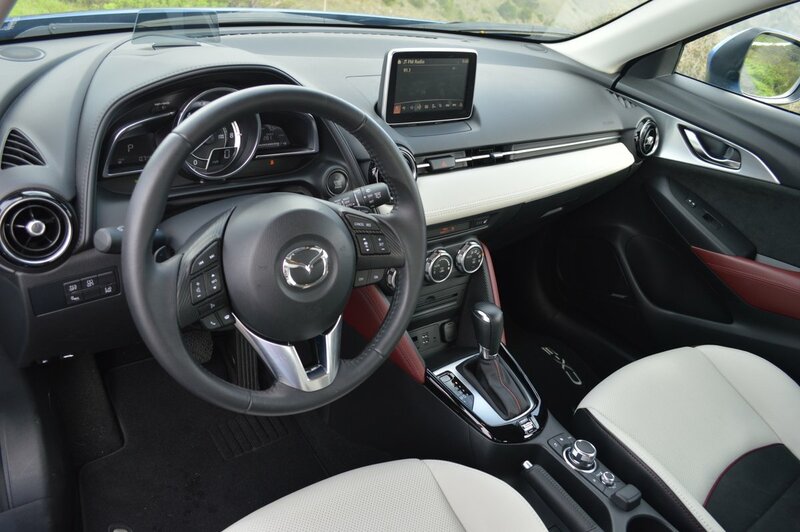 Those who have spent time in a Miata cockpit will feel right at home driving the CX-3. The manually adjustable steering wheel is perfectly situated for grip and precision control. Even the fingertip shift paddles fall exactly where you need them when you decide to assume gear control from the 6-speed “Sport Mode” automatic transmission. 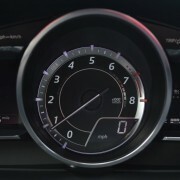 And like the MX-5 sports car, the center tunnel houses the joystick for all Mazda Connect features such as sound settings, device settings, vehicle settings, system settings, active driving display settings and safety settings. 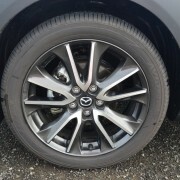 Mazda terms this large rotary dial the “Commander Switch,” and due to its partially hidden location, it will take you some time to acclimatize yourself to its operation. Most commands can be issued verbally. We were disappointed to find no menu choice available for door lock protocol. 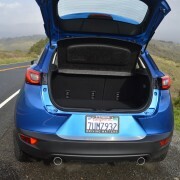 Every time we walked away from the CX-3, the doors automatically locked. When we returned, however, they did not automatically unlock. This necessitated a jab on the appropriate keyfob button, a procedure that got old real fast. 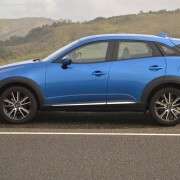 What didn’t get tiresome was the CX-3′s desire to attack back roads with sports car aplomb. 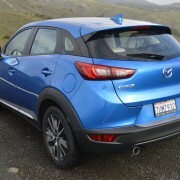 Mazda does not stint in equipping this mini-SUV with optimal wheels and tires. Our “Dynamic Blue Mica” tester sported handsome 18 inch alloy rims fitted with very sticky all season Yokohama Avid S34 radials (215/50R18). 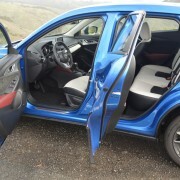 A couple of challenging backroad runs failed to dislodge the CX-3 from the line chosen by its operator. Despite its 61 inch height, this 2,945 pound mini truck carries out your placement orders with dispatch and precision. This behavior proved especially impressive during wet weather operation. Even during the worst storms, nary a skid was detected. 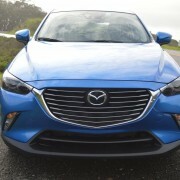 Mazda touts their belief that “Driving Matters” and in the case of the CX-3, that claim is clearly accurate. 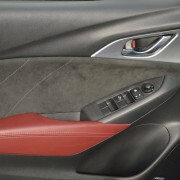 Which is not to say that some ergonomic details don’t intrude on the overall bliss. 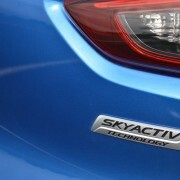 The hatchback release button, located under the edge of the rear lid, is too small and too difficult to locate. The trunk area at the rear needs a light for night loading. 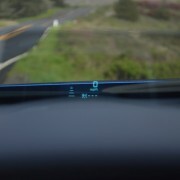 The Active Driving Display is a disconcerting addition to the dashboard. 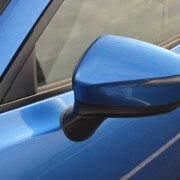 This ADD unit consists of a clear plastic screen which automatically pops up from the top of the instrument binnacle to provide speed, navigation and cruise control information. It’s a sort of poor man’s head up system, and I couldn’t find a way to shut it off or retract the screen. 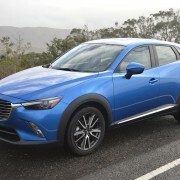 In fact, Mazda specifically warns, “Do not try to adjust the angle or open/close the display by hand.” The ADD unit is standard on CX-3s fitted with Grand Touring (GT) level trim. 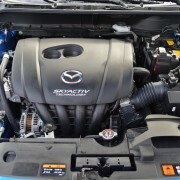 Really, these are but minor quibbles that pale into insignificance when considering this Mazda’s overall worth. 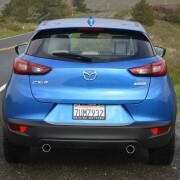 There are very few SUVs on the market that will match the CX-3 for joy of operation or for value pricing.